TODAY: The Mudcats begin their final road trip of the season with game two of a split, home/away, four game series versus the Buies Creek Astros at Jim Perry Stadium at Jim Perry Stadium. The series is currently tied at 1-1 and today's game is the 27th of 28 total meetings between the two teams this season. The Astros lead the season series 15-11. ICYMI: Dallas Carroll hit a three-run home run in the fourth and a solo shot in the sixth, Cooper Hummel hit a two-run homer in the eighth and Christian Taugner turned in a quality start as the Mudcats defeated the Astros 7-5 in the final home game of Carolina's 2018 season at Five County Stadium. 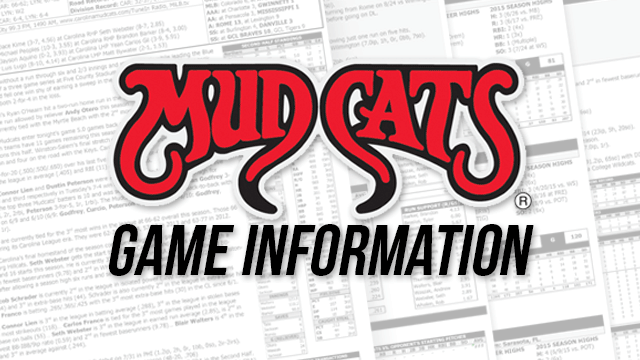 ABOUT THE LAST ONE: The Mudcats set new season highs for total extra-base hits (8: 4 2B, 1 3B, 3 HR) and walks (11) in last night's 7-5 victory versus the Astros. WHERE THEY RANK: OF Cooper Hummel currently leads the Carolina League in OBP (.394) and is tied for 4th in base on balls (62)... RHP Luke Barker leads the Carolina League in saves (20) and games finished (38). Barker is also 2nd in games (46), 4th among CL relievers in lowest batting average (.213), 2nd in fewest baserunners/9ip (9.30), 5th in highest strikeouts/9ip (9.30) and 5th in lowest BB/9ip ratio (2.36)… INF Dallas Carroll is currently 1st in the CL in games played (132), 2nd in at bats (502), 2nd in most walks (64) and 2nd in most double plays grounded into (16)... INF/OF Ryan Aguilar is tied for 1st in the CL in triples (9), tied for 3rd in most base on balls (63) and is 2nd in most strikeouts (136). DO NOT GO GENTLE: OF Dillon Thomas is batting .314/.490/.371 with a .861 OPS over 11 games with Carolina (11 H, 6 R, 5 RBI, 11 BB, 13 SO). Thomas was recently signed by the Brewers out of the independent American Association where he hit .333/.420/.601 with a 1.021 OPS over 80 games earlier this season before his assignment to Carolina (97 H, 56 R, 37 2B, 1 3B, 13 HR, 54 RBI, 36 BB, 71 SO). HUMMEL'S HALF: Cooper Hummel currently owns a Carolina League best .442 OBP in the second half. Hummel's second half (.291/.442/.487, .929 OPS [1st in CL since 6/21], 59 G) has also catapulted him into the overall CL lead in on-base (.394 OBP) this season. Hummel is additionally hitting .301/.458/.488 with a .946 OPS (52 G, 50 H, 30 R, 19 2B, 4 HR, 27 RBI) since replacing an injured Tucker Neuhaus in the fourth inning of a home game versus the Keys on 7/6. Hummel ended up going 1-for-2 with a 2-run home run (eventual game winner in the seventh) in that same game and has not missed a start since. WALK IT OFF: Seven (7) of Carolina's last 11 home wins have come in walk-off fashion (7/19, 7/24, 7/25, 8/4, 8/8, 8/17, 8/28). Those seven (7) walk-off wins have additionally occurred over Carolina's last 21 home games. Overall, Carolina totaled 12 walk-off wins this season. DOWN WITH OBP: Cooper Hummel currently leads the Carolina League in on-base (.394) and is looking to become the first Mudcats player to finish a season as the league leader in on-base since Jeremy Hermida led the Southern League with a (franchise record) .457 OBP in 2005. Former Mudcats to lead the Carolina or Southern League in OBP: Jeremy Hermida (.457, 2005), Josh Willingham (.449, 2004), Todd Sears (.434, 2000), Jason Kendall (.414, 1995). HITS AND Ks: The Carolina offense has totaled 256 more strikeouts than hits (1,297 SO, 1,041 H) so far this season. Carolina's difference in strikeouts over hits is the 6th largest in MiLB. Since 1991, only the 2017 and 2007 Mudcats have finished a season with more strikeouts than hits. Carolina totaled 164 more strikeouts than hits in 2017 (1,245 SO [franchise record], 1,081 H) and 70 more strikeouts than hits in 2007 (1,219 SO, 1,149 H). RECORD SETTING: Carolina batters have combined to total a CL record 1,297 strikeouts this season and are on pace for 1,316 strikeouts this season. The Carolina offense struck out a CL and franchise record 1,245 times last season... The Mudcats hit into a franchise record six (6) double plays 8/10 in Salem (Dallas Carroll: 5-4-3; Devin Hairston : 6-4-3, 5-4-3, 5-4-3; Trever Morrison: 3u-3-6; Rob Henry 6-4-3)… The Mudcats pitchers set a franchise record for strikeouts in a nine inning game after totaling 19 strikeouts on 5/31 in Lynchburg (Marcos Diplan: 10 SO, Chase Williams: 3 SO, Phil Bickford: 3 SO, Luke Barker: 3 SO). ... Averaged the 2nd fewest runs per game in the CL (3.95). ... Totaled the 2nd fewest runs (537) in the CL this season. ... Allowed the 6th fewest runs (593) in the CL this season. ... Won a CL high 10 extra-innings games this season.